Last Thursday, the European Central Bank (ECB) finally launched its bid to revitalize the eurozone’s economy and counter the threat of deflation with a €60 billion-a-month bond-buying program that was far bigger than investors anticipated. ECB president Mario Draghi said the bank planned to buy more than €1 trillion in assets, including government and private sector bonds by September 2016 – and could extend the program – in an effort to increase eurozone inflation to its target of just less than 2%. Investors viewed the action positively. Bond prices rallied across the board, European shares rose and the euro weakened meaningfully – on Friday it closed at its lowest level since September 2003. This low continues the pattern we have seen for much of the last year (see chart below). The ECB’s move brings its policy closer to that of the US Federal Reserve and Bank of England, which commenced buying government debt following the 2008 global financial crisis. The ECB’s program is not as straightforward to manage as quantitative easing QE undertaken in the US. It includes some limitations on how much debt from each eurozone member the ECB can buy. The ECB will not buy more than 25% of new debt issued by any country and not more than 33% of that country’s outstanding debt. It is also expected that much of the burden for losses on sovereign bonds bought under QE will lie with individual member states. As with QE in the US and Japan, it seems most likely that QE will aid the financial markets; its effect on the economy is less certain. For example, while the US undertook three and a half rounds of QE over a six-year period, there is still debate over how much the policy benefited the average worker or business. The stimulus provided more discernible benefits for investors and large corporations. It may be harder to create a similar wealth effect in Europe. European retirement is paid for by the government, meaning individual investors’ participation in stock and bond markets is significantly lower than in the US. One immediate impact of the plan is that it makes the dollar stronger. This will put even more pressure on commodity prices (many commodities are dollar-denominated). At the same time, it could help make European equities more attractive to US investors. If eurozone QE impacts the market similarly to how it has affected US and Japanese equities, eurozone equities are likely to move higher. 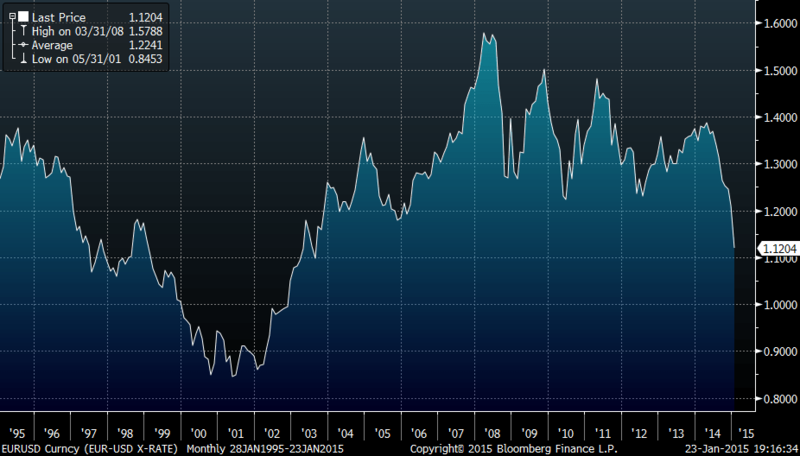 While the euro is currently weak, over the last 20 years it has traded well above current levels. A weaker euro could also benefit the eurozone’s economy in the form of increased exports and fewer imports. If the euro strengthens, investors who purchase foreign equities in US dollars will benefit from higher stock prices as well as a stronger euro. In 2014, international equities were comparatively poor performers. This is likely to reverse over time. As a result, we believe there will be opportunities to acquire well-managed, attractively valued eurozone equities trading at a discount to fair value, which should benefit client portfolios.